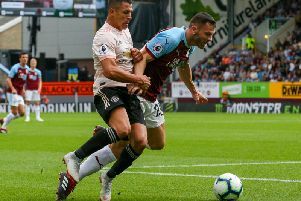 Burnley midfielder Jack Cork has suggested that Premier League survival this term would be just as impressive as the club’s seventh place finish last season. Securing European football for the first time in 51 years was a huge achievement for the club as the Clarets recorded their highest finish in the top flight since 1975. But, once their Europa League journey ended just short of the group stages at the end of August when Greek giants Olympiakos won the play-off 4-2 on aggregate, it’s been a real slog. Sean Dyche’s side failed to win any of their first 11 games in all competitions, needing extra-time to see off Aberdeen and Istanbul Basaksehir, and they dropped in to the bottom three in the league as a consequence. Back-to-back wins against tomorrow’s opponents AFC Bournemouth and Cardiff City engineered a temporary climb towards mid-table but a run of one win in 11 games inflicted further damage as they ended Boxing Day in 18th position. A record-breaking run of eight games without loss at this level painted a more promising picture and then the most recent triumph against Wolves arrested a spell of four defeats on the bounce that had once again threatened their future. Following Dyche’s 300th game in charge, Cork said: “He’s done a great job and it’ll be even better if we stay up this year. “It’s been a difficult year, we had a difficult start so to get control and hopefully bring us out of it would be great. “He’s done great over the years with two promotions, taking the club back up after relegation. It’s not often you see managers staying at clubs this long. He’s done well. “It’s been a difficult season. It was a really enjoyable one last year but we’ve had pressure on us throughout this season and it would be a big relief if we can stay in this league for next season. “When there’s no pressure you can relax and play football. When you’re in good form the opposition seem to miss their chances more. “You get a lot more luck but when you’re down there and things aren’t going your way things go against you. That’s how it stays and it knocks your confidence. We’ve done well to try and pull ourselves out of it.